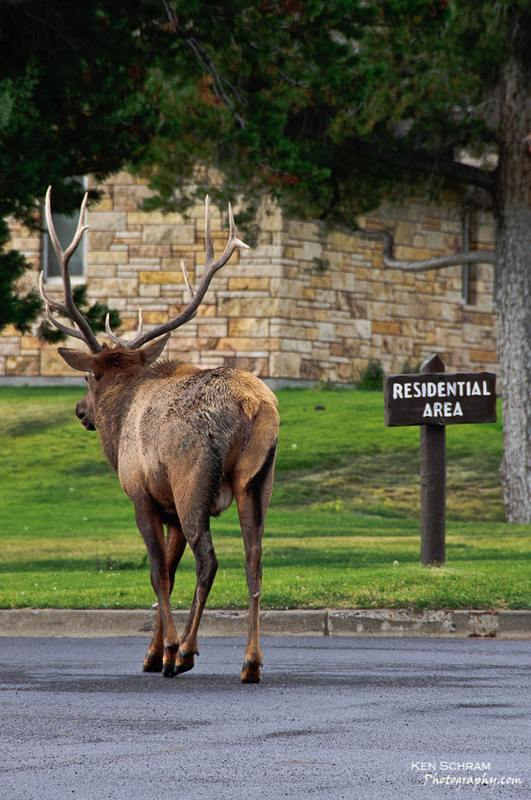 As we drove through Mammoth Hot Springs on our way out of the park, we noticed a lot of warning signs informing visitors of the dangers of elk wandering the village. "DO NOT APPROACH ELK". On our way out of the village we saw a crowd of onlookers, cameras in hand, congregating near the village square. 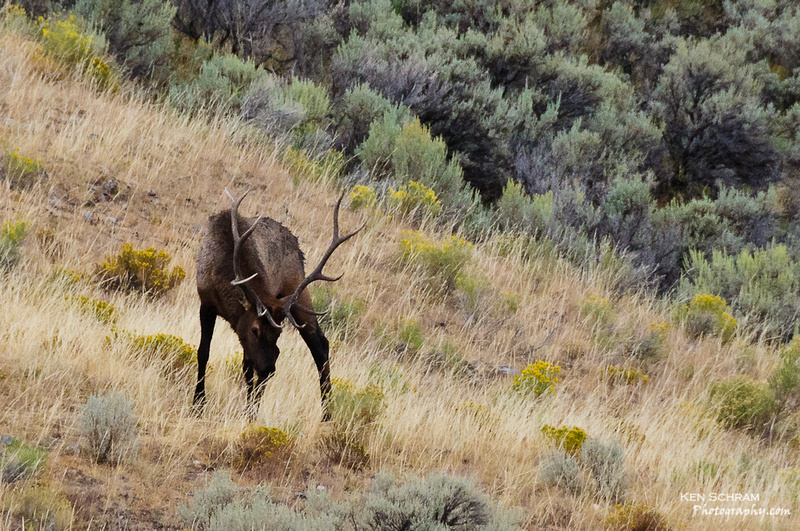 We pulled in behind a park ranger and noticed a bull elk grazing on the hillside less than 50 yards from the edge of the road. Now of course when you post signs every few feet appealing to the "intelligence" of the human race -"DO NOT APPROACH ELK" - there will always be some idiot who either takes that as a challenge or simply thinks it doesn't pertain to him. In this case, there was an elderly gentleman toting a DSLR with a rather long lens who felt the need to get closer to the subject matter and started walking up the hill toward the big bull. Standing right next to the park ranger I saw him reach for his sidearm as he yelled across the square for the man to back off. I could only think to myself, "If you draw that pistol, it better be to shoot the idiot and not the elk!" After the bull raised his head and bugled a few times the elderly gentleman (idiot) did shuffle back down the hill. 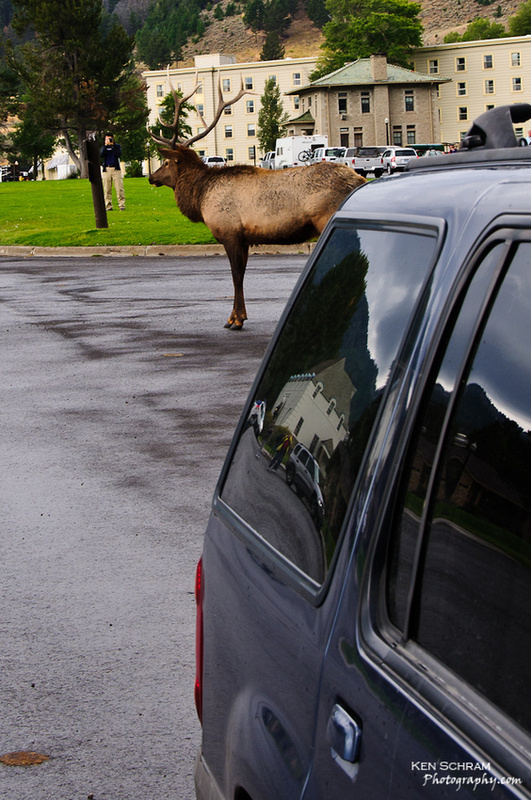 The ranger then informed the crowd that the cow elk and calf were on the other side of the road and the bull was likely to continue on down the hill into the village. The words no sooner left his mouth when we heard the calf call out behind us and the bull continued on down the hill. Notice how I've strategically placed our truck between me and the 700+ pounds of antler wielding muscle :). That's right, I read the signs! As the bull continued on through town toward his family, I saw the image below through the viewfinder and the title popped into my head even before I released the shutter. I called it "Up Yours!". After all, who was here first? Use the comments section below to offer up your own title for the above image and remember to have fun.